Motorola really are the leader in complex communication systems, time and time again we see (and report) stories of Motorola completing projects forÂ prestigious businesses and organisations. This articleÂ highlightsÂ their latest finished project. Airport operator SEA Group (SocietÃ Esercizi Aeroportuali S.p.A.) has selected Motorola Solutions to improve operations and ensure the highest levels of security, efficiency and effectiveness at Milanâs Linate and Malpensa airports. Deploying a TETRA Dimetra IP Compact radio communications system to connect both of Milanâs airports, SEA is able to provide enhanced customer services with rapid flight turnaround and more efficient terminal operations. In Malpensa – where the old and the new systems had to coexist in the migration phase – everything was fully operational within just two weeks, including the configuration of 1,000 new radios. At Linate airport, the system, supporting 400 new radios, was set up in just a week. Motorola Solutionsâ high-performance TETRA base stations now deliver TETRA network coverage in both airports. Old radios used by personnel throughout the airports where also replaced with new TETRA digital handsets. Motorola Solutions has signed a four-year managed services agreement with SEA, guaranteeing technology evolution including the replacement of its complete telecommunication system (controller, base stations and radios). Motorola Solutions will provide global integrated services infrastructure with highly qualified technical support and certified repair centres that will provide fast repair times and expert technical support for the system for many years to come. In September 2015, Motorola Solutions will upgrade the connections at both airports with the latest generation of Motorola Solutions TETRA system Dimetra 8.2 enhancing data transmission and offering the SEA the opportunity to develop rich data services to further improve both operations and the customer experience at Milanâs airports. 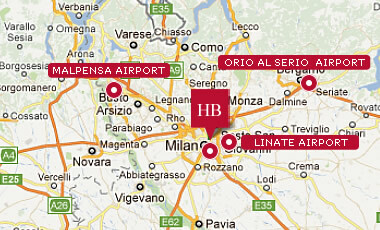 The Linate airport is about 8 km from Milan. The airport serves a frequent flyer client traveling to domestic and international EU destinations. At the two airports, the Group offers all services and activities related to the arrival and departure of aircraft: management of the airport safety; passenger and cargo handling; continuous development of commercial services for passengers, operators and visitors.